The Soap Club is $12.95 every month plus $3.95 shipping. The Soap Shack also offers a Spoil Me Box which includes at least five handcrafted bath and soap products every month for $29.95 plus $5 shipping. This is the first time that I have received a dual shampoo-soap bar since I have been subscribed, so this was exciting. Off the bat, the tea tree and lavender scent are lovely, and I love that it is made with steam-distilled essential oils to nourish your scalp. This is also made with coconut oil, olive oil, castor oil, and sweet almond oil, so it is nourishing and gentle. Oh wow, this smells just like cherry almond, and I am here for it. Lathering up with this makes me smell like a whole snack. I like how the blend of olive oil, rice bran oil, coconut oil, shea butter, and cocoa butter is hydrating and not stripping to my skin. Plus, I love the added touch of being able to plant the labels that these soaps come in. The Verdict: I really enjoyed the scents sent this month, but I am conflicted now that this subscription no longer comes with free shipping. With shipping, this box costs $16.90, which is higher than the $14.44 combined total retail value of the two bars of soap. I think the soap is of high quality, but I don’t know if this subscription has the needed value to make it a good deal. Can you get this box if you sign up today? No, you will get the April box. You must order before the 15th of the month to be sure to get that month’s shipment. Value Breakdown: This box costs $12.95 + $3.95 shipping, which means that each of the 2 items in the box has an average cost of $8.45. 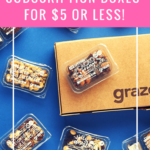 Check out all of our The Soap Shack reviews, more bath subscription boxes, plus the best personal care subscription boxes! I was thinking of signing up but This new shipping fee is tragic! I usually do the 3 mon sub which lowers the cost of each bar, but will have to go back and see if shipping was added in my last renewal. I don’t like to pay shipping either and that’s a bummer since I love their soaps! I got Cherry Almond also in my last box too- it smells divine! Great review! The cherry almond sounds divine. That’s a bummer about the added shipping. I receive this box and really enjoy it. My variation was different then yours. I have not seen anything about shipping being added. Did not receive an email that I can recall and can’t find anything on website either. When does this go in to effect? I was not charged shipping for the April box. I’d been planning on subscribing to this box, but now they have added the cost of shipping, I don’t think I will. That is disappointing.